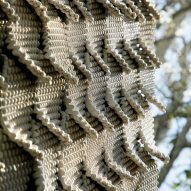 Succulents and other small plants grow from the tiles that clad this 3D-printed shed, which was designed to offer a solution for the Bay Area's housing shortage. Located in a backyard in Oakland, California, the Cabin of 3D Printed Curiosities was designed by Emerging Objects – a local studio focused on experimental uses of 3D printing. The practice was founded in 2012 by Virginia San Fratello and Ronald Rael, who both earned their graduate architecture degrees from Columbia University. The oversized shed was conceived in response to the city's loosening of rules about accessory dwellings – small backyard structures that can help ease housing shortages, particularly in dense, urban areas. "Due to a housing emergency in the Bay Area, the Oakland City Council eased restrictions on the construction of secondary housing units, or backyard cottages," the studio said. "This has opened the door for Emerging Objects to use the relaxed codes to experiment toward addressing housing problems at a micro scale." 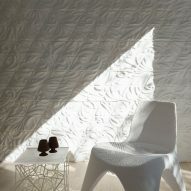 The project also provided an opportunity for the studio to deploy its 3D printing expertise at the scale of a building. "The 3D-Printed Cabin brings many of our material, software and hardware experiments together to demonstrate the architectural potential of additive manufacturing on a weather-tight, structurally sound building," the team said. Rectangular in plan, the gabled-roof building encompasses 120 square feet (11 square metres). 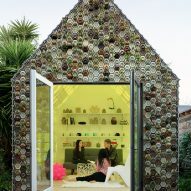 Approximately 4,500 ceramic tiles were used to clad the cottage, which has a wooden balloon frame. On the front facade, the studio used its Planter Tile system, which consists of hexagon-shaped tiles made of various materials. These include Portland cement, sawdust and "chardonnay" pomace" – the solid material left over after wine grapes are pressed for juice or oil. The substance consists of skins, stems and pulp. 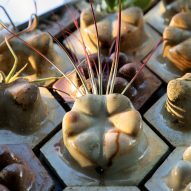 The tiles come in six different patterns, four of which have protrusions with little openings, giving the tile "the capacity to hold plant life". The Oakland dwelling features a range of tiny plants that are well-suited for the area's climate. "The front facade has been described as a box of exquisite chocolates – comprising a number of Planter Tile shapes and materials to create a living wall of succulents, which naturally thrive in the northern California climate," the studio said. The rear and side facades, along with the roof, are clad in a 3D-printed ceramic screen designed to be hung on an exterior or interior wall. The screen is composed of "Seed Stitch" ceramic tiles, so named because their surface emulates a knitting technique called the seed stitch. By manipulating the conventional 3D-printing process, the team is able to create a screen with a handmade aesthetic. The team used customised G-code – a computer numerical control (CNC) programming language – to print the tiles. During fabrication, the tiles "wave back and forth", which causes the printer to pull at the lines of clay. This pulling motion results in the formation of loops of varying sizes, producing a "distinct machine-made texture that is different every time". "G-code is used to control each line of clay as it is 3D printed to create a loopy texture that looks like seeds scattered across the surface," the studio explained. "While all ceramic tiles are printed from the same file, each tile is intentionally unique as a product of fabrication." Inside, the team installed its Chroma Curl Wall, which consists of back-lit translucent tiles made of bioplastic derived from corn. In addition to a futon, the room is fitted with chairs, a coffee table and decorative objects that were all 3D-printed using bioplastic. At night, the interior is illuminated by LEDs that lie behind the walls, converting the cottage into a "beacon of light, in ways that are abstract and artificial". The synthetic aspects of the interior contrast with the natural materials adorning the front facade. "The Cabin of 3D Printed Curiosities demonstrates that 3D printing can be beautiful, meaningful and well-crafted – not crude, fast and cheap," the team said. The project also demonstrates how the accessory dwellings can provide opportunities for experimentation. 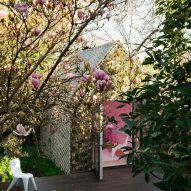 "Much like the garage maker-space, the backyard building space might become a platform where new ways of living are tested, new technologies can be invented and tested, and new materials can be discovered," the studio said. Other accessory dwelling initiatives in America include a backyard studio in California by Cover, which was created using computer algorithms and prefabricated elements, and a micro dwelling by UCLA architecture students called the BI(h)OME.